This literature review attempts to chronicle research on features of effective online learning environments. While there is an overwhelming amount of research about online learning in general, it was difficult to find sources that give concrete examples of what online learning should look like. In this course, Research Methods in Education, I learned about the portfolio and project options of the M.Ed Program, and began thinking about my final project. Though my portfolio proposal is not representative of what I have produced here, I came away from the course with valuable knowledge, especially about critical research. In seminar presentations we focused on the methods employed by the researchers to collect data and draw their conclusion rather than content. I was surprised how easy it was to doubt research findings considering we rely on them so heavily. This realization game me a new perspective about knowledge. Rather than static and factual, what we find are subjective interpretations of events. Too easily my classmates and I dismissed research as being useless or meaningless due to flaws in methodology. Now I would argue that any finding, no matter how small the sample, or limited the validity of the study has value when discussed in a learning community like the M.Ed classroom. Dr. Desjardins once told me that the only way we can ever learn something new is to engage the opinions of others. If we don’t, no matter how much data we gather, our knowledge is limited by our own perspective. This is one of the most valuable lessons I will take away with me from my M.Ed. Every student, teacher, and person we encounter has something to teach us if we are only willing and patient enough to see it. I am obligated to include Anderson’s “Toward a Theory of Online Learning” in my literature review because it surfaced in both my Online Technology in Education and Leadership and Technology courses. In this chapter Anderson assesses how people learn based on Bransford, Brown, and Cocking’s (1999) How People Learn, Brain, Mind, Experience, and School (which has been discussed in my Students and Technology theme), and how the web can enhance these learning contexts. Anderson presents a model of e-learning (2004). According to Bransford, Brown, and Cocking (1999) effective learning environments are “framed within the convergence of four overlapping lenses. They argue that effective learning is learner centered, knowledge centered, assessment centered, and community centered” (Anderson, 2004, p. 35). 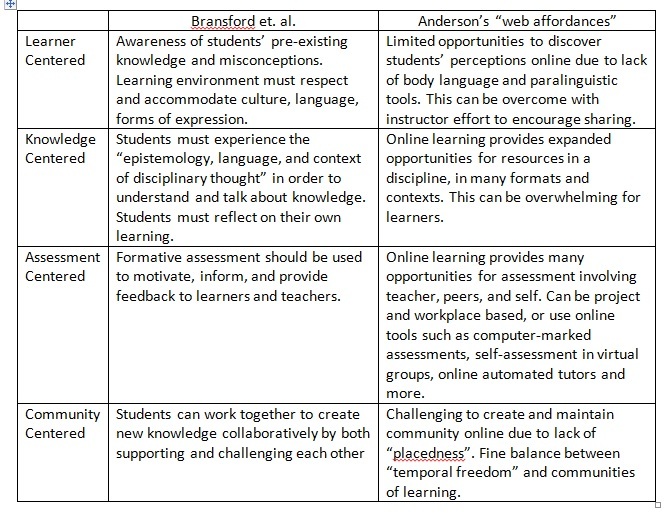 I have created a chart showing a description of the pillar and online learning “web affordances”. Since coming to this conclusion through my assignment, I have moved on to consider tools and specific approaches for creating this type of environment. Though Andragogy appeared in my Educators and Technology theme, I have included it here in its application to online learning because after learning about adult learning principles they strongly influenced the design of online learning in my Analysis and Synthesis artifact from Principles of Learning, Technology Integration paper from Technology and the Curriculum, and Online Learning Literature Review from Research Methods in Education. In “Evaluation and Application of Andragogical Assumptions to the Adult Online Learning Environment”, Blondy finds that andragogy principles are an ideal starting point for instructional approaches in adult online learning (2007, p. 116), and performs a thorough analysis of their implications, noting that creating an online environment that meets the needs of adult learners is no easy task (118). Below I have pulled out some specific examples from the article that can help to firm a vision of what online learning should look like according to Knowles principles of Andragogy. Clear communication by instructor at start of course informing students of their responsibility to identify specific personal learning goals and preferred learning activities. Ask questions and encourage use of previous experience, connection of task to learning goals etc. Maintain communication with learners to assess self-directedness. Experience – Adults play different roles in society and thus have experience that serves as a valuable recourse for both learners and facilitators (p. 121). Prior experience could also negatively affect learner in the form of “preconceived notions about reality, habitual ways of thinking and acting, and prejudices” (p. 121). Curriculum must foster sharing of experiences by way of group projects and interactive discussions. Course content must evolve according to course participants. Readiness to Learn – Often, life events (i.e. job loss, divorce) cause adults to need to learn something new. Knowles believed that though learning is primarily done out of necessity, the experience should also be pleasurable. For this reason it is important to combine both personal and organizational needs (p. 123). Instructor must help learners identify their learning needs because those needs should be the central focus of the course. Resources must be made available to support needs (i.e. online library access, help lines, counseling, technical support) (p.124). Problem Oriented – According to Knowles (1984), adults pursue learning because they need to immediately apply their learning to life situations (Blondy, p.125). Online learning curriculum must be process based to allow learners to develop content in accordance with their own needs. Internal Motivation – Knowles (1984) believed that adults are motivated internally, by resulting increases in self-esteem, self-actualization, and recognition. Adults are motivated to succeed when they are recognized and appreciated (Blondy, p. 126). Acknowledge learning contributions weekly or more often (p. 126).